Welcome to The Abso!ute Sound online! We explore music and the reproduction of music in the home. We believe that the sound of music, unamplified, occurring in a real space is a philosophic absolute against which we may judge the performance of devices designed to reproduce music. Our goal is to provide the resources consumers need to judge how a component's sound either honors or departs from the music's truth, and to make sound purchasing decisions that maximize their experience of reproduced sound. Below is our Issue 161, April/May 2006 table of contents and editorial. Listening to Levinson’s latest, Robert Harley finds the company’s tradition of excellence not just upheld but improved upon. Spin a few LPs with Jonathan Valin, who is savoring some tasty analog goods. Neil Gader on an Italian speaker that makes you feel right at home. Sallie Reynolds on two sweet performers from Denmark. Jacob Heilbrunn listens to the latest from TEAC’s high-end division. Class D amps are all the rage. Chris Martens listens to another offering inthis rapidly growing field. 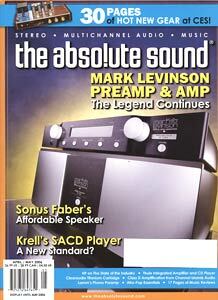 Fred Kaplan explains how one player changed a critic’s mind about the SACD format. Memoirs of the CES: What happened in Las Vegas doesn’t stay in Las Vegas—this time around. Reviews of 11 new CDs, including the latest from the Flaming Lips, Drive-By Truckers, Cat Power, Loose Fur, Rosanne Cash, Sarah Harmer, Tom Zé, and Swearing at Motorists. Plus, a round-up of recent Pure Pleasure and Analogue Productions audiophile blues LPs. Shostakovich’s Cello Concerto No. 1 with Han-Na Chang, Shostakovich’s Piano Trios Nos. 1 and 2 with Beaux Arts Trio, Handel’s Delirio with Natalie Desay, and five more new CDs critiqued. Also, four Mozart SACDs with which to celebrate the composer’s 250th birthday. The scoop on the latest from Manu Katche, Ken Hatfield, Paul Motian, and Quinsin Nachoff, plus four Nina Simone reissues and Monster Cable’s Vince Guaraldi set. Sue Kraft goes shopping on eBay.